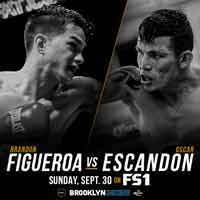 Review by AllTheBestFights.com: 2018-09-30, nice and tough exchanges between Oscar Escandon and Brandon Figueroa: it gets three stars. The former Olympian and former interim world champion in two weight classes Oscar Escandon entered this fight with a professional record of 25-4-0 (17 knockouts) and he is ranked as the No.22 featherweight in the world but he won just one out of his last four bouts, against Robinson Castellanos in 2016 (Robinson Castellanos vs Oscar Escandon). After this fight he has lost to Gary Russell Jr (Gary Russell Jr vs Oscar Escandon) and Tugstsogt Nyambayar (Tugstsogt Nyambayar vs Oscar Escandon). His opponent, the undefeated Brandon Figueroa (younger brother of Omar Figueroa), has a perfect boxing record of 16-0-0 (11 knockouts) and he entered as the No.71 in the same weight class. In his last three fights he has won over Victor Proa, Giovanni Delgado and Luis Roy Suarez Cruz. Figueroa vs Escandon is the main event of the evening. Watch the video and rate this fight!